3.7 out of 5 based on 83 bloggers and 22 commenters. 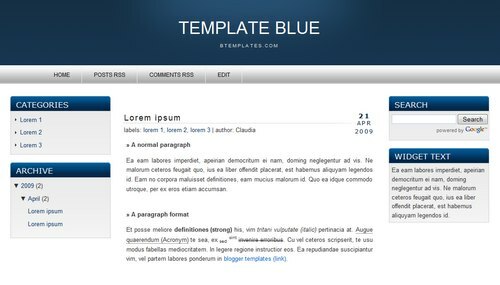 Template Blue is a free blogger template with 3 columns, left and right sidebars and neutral colors. I like this template and I will can!! Howcan i make the header black? how to insert read more in this template? I am using this template, but facing some error i.e., links list is overwrited by blog posts and side bar materials. hi. im using this template. it’s good and simple. but when i open my comments, i see commentario instead of comments. i want to change the “commentario” to comment because im using english for my site. how can i change that? and also how can i change “Posts Relacionados” to related posts? I was also wondering how I can manage/ link stuff to the tabs on top…I can’t seem to be able to use multiple tabs at the moment!! I’m also facing same problem as Blaise said. My site is in English. How can i change those words (commentario & Posts Relacionados) to english. Please tell me the solution. Go to Layout/HTML Edition and use the search form in your browser to find the words you want to change. Hi, I installed this template, and there are no menu options available. I looked for them to edit, but I never had any when I installed the template. Is there a code I can use to add that, or what can I do? Click on “Expand widget templates” and use the search form in your browser to find the text you want to change.